Travis checks in with a look at a very unusual sixth scale figure - tell us all about it, Travis! Thanks to Michael, I'm back for another guest review! Back in 2007 a little movie called "The Condemned" came out. Being a huge WWE and Stone Cold Steve Austin fan, I caught it while it was in theatres and although it's not the consensus opinion with the viewing public: I absolutely loved it. I felt it was a great package of a movie with tons of action, good acting by all involved, and a engaging storyline. Especially when compared to other WWE Films productions, this one just seemed a bit better than the rest. At least to me. Jack Conrad (Austin) is a dangerous convict currently awaiting execution in a corrupt Central American prison. "Purchased" by a wealthy television producer and transported to a deserted island, the formidable inmate is offered the opportunity to avoid capital punishment and win back his freedom by fighting to the death against nine other condemned criminals in an illegal game to be broadcast uncensored over the Internet. Although the movie came out over 4 years ago, no merchandise in the figure realm appeared. I'm assuming it was because of the R rating, but really, does that stop some toys from being made? 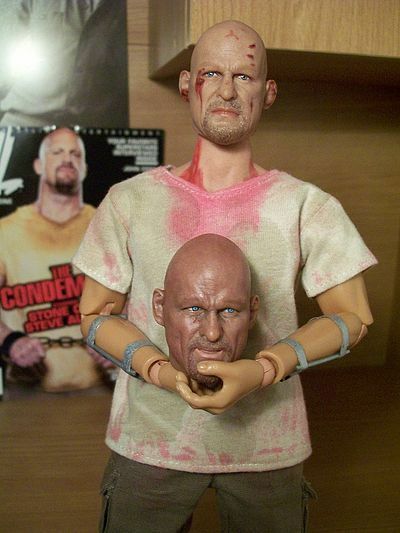 I really thought there would eventually be a WWE figure 2 pack featuring Stone Cold the wrestler and Jack Conrad, his Condemned character. They had done it previously with The Rock and The Scorpion King, but that movie was more kid friendly. The 1/6 figure market is swamped with all kinds of high end collectibles of almost every film star you can imagine. Hot Toys alone domineers the market with the just about every license out there, but not even they can secure every one you may want. Luckily, there are smaller companies out there that make figures that might not ever see the light of day. And, honestly, like Hot Toys has ramped up their game in sculpting/painting/etc., so have some of the smaller companies. Being that there's no text on the box, aside from the title "The Criminal", I can only pass on the info that you can find online. The figure is made by a company called "Heroic." At least I think that the companies name. I really have no clue, but all that aside, I'll just let the figure speak for itself. Without further ado, lets get to the review. As Stone Cold says in the movie, "Game on." Oh, and always, I apologize in advance for the cruddy photos. The package is a extremely basic and consists of a black slip cover The package is a extremely basic and consists of a black slip cover over a white box. Don't let the low score make you think the package doesn't do it's job. It does it extremely well, but as packages go, it's just plain. There's a photo of the figure on the front of the box with text naming the figure, "The Criminal", but other than that, there's nothing at all. 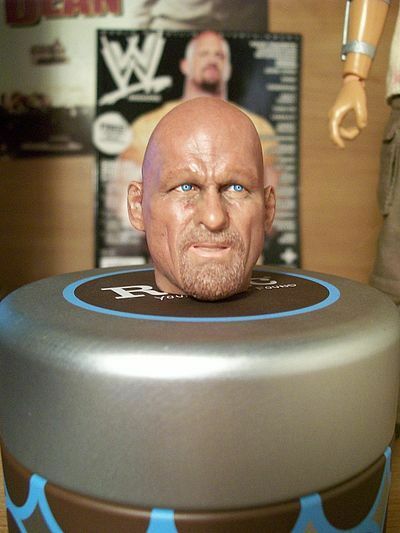 Inside the box, the figure is held in place by laying in a plastic bubble with a figure sized indention, exactly like almost all action figures are. The accessories, and his head, are placed in plastic zip baggies to protect them from scratches while in transit. As I said: plain, but does the job it's meant to do. Before I start, let's address the obvious: This is not a figure made by Hot Toys and to compare it to them would be unfair. Especially when you consider it cost a fraction of what Hot Toys figures run, so you get what you pay for. As I said, the 1/6 market has made leaps and bounds in the sculpting and painting categories and this figure really shines in those categories. Although the body appears to be a stock BBI 3.5 version and could be better, it could always be replaced if you chose, so I won't count too much against it in this category. 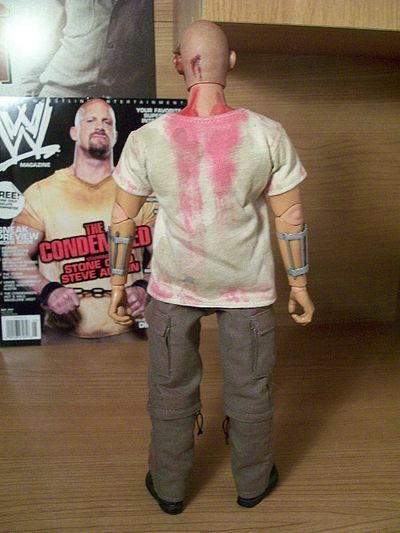 They actually added a sculpted neck and chest piece under the shirt and I really wish there would've been a way for them to add muscular arms to complete the Stone Cold look. The figure comes with two heads and both have unique sculpts and aren't the same head with different paint. In my opinion, one looks more like Steve Austin than the other, but only when I compared them side by side. Alone, without comparisons, they both look like him to me. Aside from the heads, the accessories are sculpted and look great. Great detail all around, but more about that in the accessories section. The figures comes in the package with his battle damaged head and it's beautifully painted. One of the reasons I'm writing this review is I've read so many negative things about this figure online. (I've never seen a review, just negative comments about photos of the figure.) I have to say, photos I've seen online do not do this figure justice. 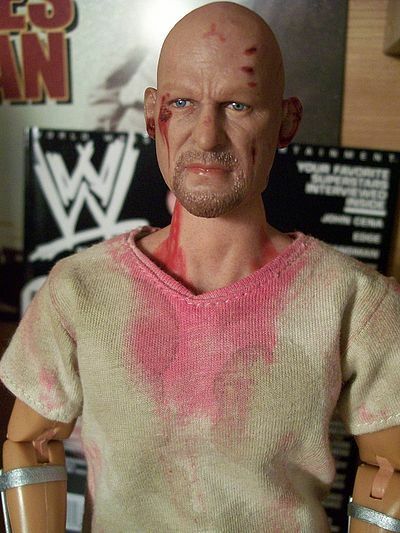 The paint on his bloodied head alone is flawless, with sparkling eyes, great facial hair and realistic lips and blood. Also, the skin tone is very realistic on the battle damaged head, but to be honest, it's extremely tan on the other head. It doesn't really match as well with the skin of the figure, but it's passable. The neck and chest have the same skin tone as the battle damaged head with nice blood, and shading. Although there's no blood anywhere else on the body, the shirt and pants are nicely stained with blood, sweat and dirt. a stand to keep it standing over long periods of time, but that's easily fixable. Aside from his screen accurate outfit, the figure comes with some great accessories. Taped to his forearms are the metal bars Jack Conrad used as a makeshift defensive weapon in the movie. These could be removed, if you chose to upgrade his body and yes, they are real metal. 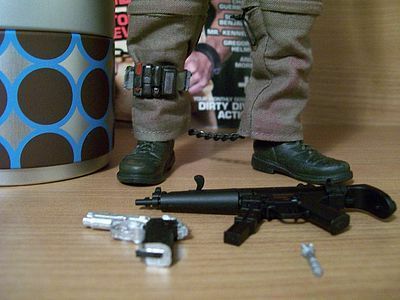 He has a machine gun with removable clip and extending stock. A small silver handgun that appears to be a recast with no moving parts. He has shackles for both his wrists and ankles and are screen accurate. 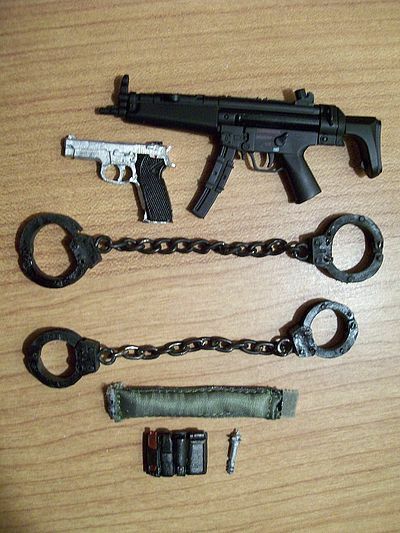 The cuffs are plastic, but the chains are metal. Lastly, if you've seen the movie, you'll know the last accessory is an important one: his ankle bomb! Like everything else, it is screen accurate and has all the features from the red pull tab to the defusing key. (that is removable!) Nice! As I mentioned above, he also comes with an extra (non battle damaged) head. 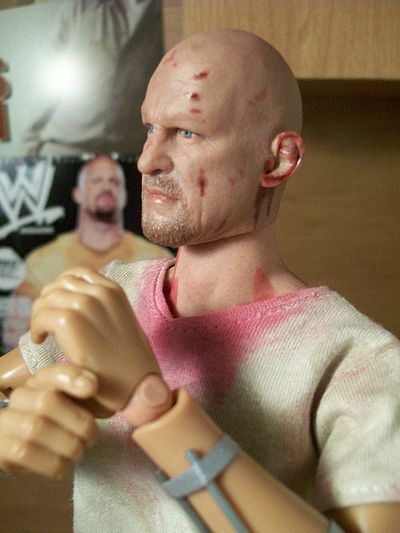 Although the paint on his skin tone is darker than the other, the eyes, lips and facial hair are extremely well done. Accessories aside, his outfit consists of a tan shirt, khaki pants and sculpted boots. The clothes are all very nice and look exactly like his outfit in the movie. 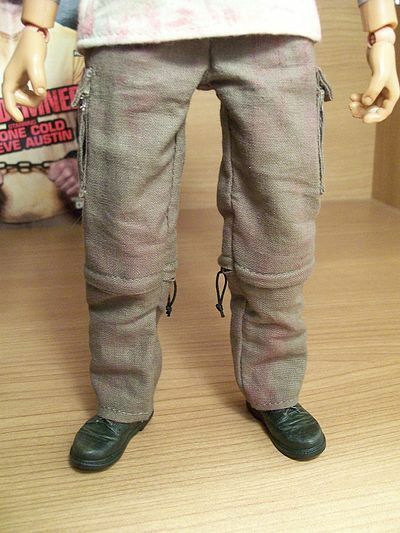 They are nicely weathered with blood, sweat and dirt and they represent Jack Conrad in mid adventure. 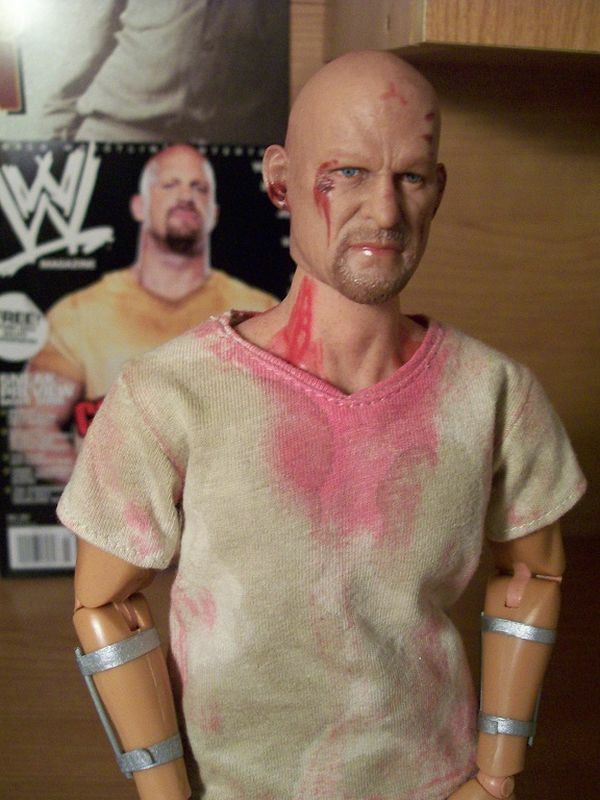 As simple as the outfit sounds, this is how Stone Cold appears for almost the entire movie. The only thing he could've came with, (I guess) is a clean version of the pants and shirt to represent the first part of the movie, but I love the dirtied version, so no complaints here. 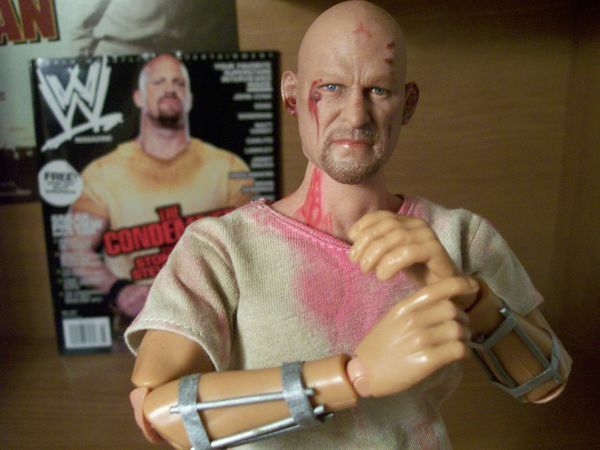 I'm not sure how many kids got to watch The Condemned, but I know a LOT of kids love Stone Cold Steve Austin, so the fun factor goes through the roof if they're a fan of his. For everyone else, this figure deserves a look and I think most people would enjoy it if they gave it a chance. I'm glad I did. Ok, here's the deal: This figure is listed at $84.99 plus shipping, but I got mine for $59.99 and that included free shipping from China, so my score will reflect that. Do I think I got a good, fair deal? YES! I was really afraid of what the quality/paint/etc. would be once I had it in hand, but I was happily surprised. No, it's not as good as anything fresh out of the Hot Toys factory, but it's better than you'd think. I'd be careful with the taped forearms. They are very nicely taped and snuggly in place, but it's still just silver tape and could be damaged if you're not careful. I'm not even going to attempt swapping the heads out, for fear of damaging the head or neck post. I bought this one through eBay, but they are available through many 1/6 dealers online, as well. Shop around to find a good deal. This product was purchased for the review by the reviewer. Photos and text by Travis.